When the Red Sox look back at Tuesday night’s momentous 6-3 victory over the Tigers, which finally got them over the .500 mark for the first time this season, they will no doubt point to Daniel Nava’s fourth-inning at-bat against Justin Verlander as not only the defining moment of the game, but, perhaps, the season. Although David Ortiz led an 11-hit barrage by going 3 for 4 two doubles and a solo home run, Nava delivered the crushing blow with two outs and the bases loaded in the fourth. He hit a 100-mile-per-hour fastball for a bases-clearing double to left off the American League’s reigning League Cy Young winner and Most Valuable Player. It was Nava’s confrontation with Verlander that enabled the Sox to take a 4-0 lead. It provided a comfortable working margin for Daniel Bard, who improved to 5-5 and lowered his ERA to 4.56 after allowing two runs on five hits (including a pair of solo homers by Jhonny Peralta and Prince Fielder) and issuing two walks with four strikeouts. “That was maybe one of the best at-bats I’ve ever seen against probably the best pitcher of our generation,’’ said Bard, who threw four scoreless innings before giving up Peralta’s shot in the fifth. Although they played without second baseman Dustin Pedroia (torn thumb muscle), the Sox lashed 10 of their 11 hits against Verlander. Verlander (5-3, 2.55 ERA) absorbed his second consecutive loss after giving up five runs over six innings, departing after throwing 105 pitches, 75 for strikes. Verlander had a 16 2/3 innings scoreless streak against the Sox snapped in the second when Ortiz hit a leadoff double off the Wall, then advanced on Jarrod Saltalamacchia’s sharply struck single to left. Mike Aviles grounded into a force at second that wiped out Saltalamacchia, but enabled Ortiz to score from third that gave the Sox a 1-0 lead. The Sox tacked on three more runs against Verlander in the fourth. Kevin Youkilis led off with a single to center and, after Saltalamacchia struck out, Aviles followed with soft single to shallow center. Scott Podsednik singled to right, loading the bases for Nava. Verlander attempted to dominate early, pumping a pair of four-seam fastballs at Nava that reached 98 and 100. Nava fouled off the first pitch and took the second for a ball. After Verlander missed with a curveball, Nava laid off a 100-m.p.h. fastball that also missed the strike zone. Verlander went to a 99-m.p.h. four-seamer - for a swing-and-miss - that ran the count to 3-and-2. Nava stood in and handled the best Verlander had to offer on the next pitch – 100-m.p.h. heat – and sliced it to left for a double that cleared the bases. It was Nava’s first hit against Verlander. Nava was happy to come through. The Sox scored in the fifth when Adrian Gonzalez singled to right, then scored from first on Ortiz’s double to center, giving him 18 on the season. 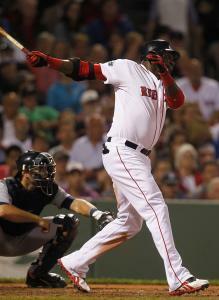 Ortiz, however, wound up getting thrown at third trying to stretch it. Verlander got out of the inning by inducing Youkilis and Saltalamacchia to hit grounders to third. Fielder crushed a 1-and-2 pitch over the visitors’ bullpen in right to cut Boston’s lead to 5-2. After Bard struck out Delmon Young on a 92-m.p.h. fastball, his 94th pitch of the game, he was lifted by Valentine, who summoned Rich Hill. Hill induced Brennan Boesch to ground to first, then walked Alex Avila before turning it over to Scott Atchison, who gave up a single to Peralta, then got Santiago to pop to second.